Princeton NJ -- Four Princeton faculty members received President's Awards for Distinguished Teaching at commencement ceremonies June 5. 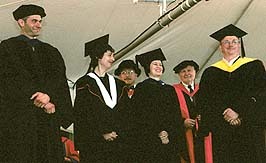 Presented with President's Awards for Distinguished Teaching at commencement ceremonies were (from left): Andrew Isenberg, assistant professor of history; Elias Stein, the Albert Baldwin Dod Professor of Mathematics, who could not attend and whose award was accepted by his daughter Karen; Diana Fuss, associate professor of English; and Lynn Enquist, professor of molecular biology. They are: Lynn Enquist, professor of molecular biology; Diana Fuss, associate professor of English; Andrew Isenberg, assistant professor of history; and Elias Stein, the Albert Baldwin Dod Professor of Mathematics. The awards were established in 1991 through gifts by Princeton alumni Lloyd Cotsen '50 and John Sherrerd '52 to recognize excellence in undergraduate and graduate teaching by Princeton faculty members. Each winner receives a cash prize of $5,000, and his or her department receives $3,000 for the purchase of new books. A committee of faculty, under-graduates and graduate students selected the winners from campus-wide nominations. Enquist has been a Princeton faculty member since 1993. A specialist in neurovirology and a former researcher in the pharmaceutical industry and for the National Institutes of Health, he designed and teaches a course on "Viruses: Strategy and Tactics." "Lynn thinks like a virus, and he can convey this to students effectively," wrote one of his colleagues in nominating him for the award. "All viruses are fiendishly clever the strategies they use to subvert human defenses are amazing. Because of this, and because of Lynn's knowledge and enthusiasm, the students are enthralled." In their nomination letters, students wrote of Enquist's comprehensive preparation for class, including the compilation of detailed notes that become invaluable resources and the design of a Web site that expands upon class materials. Many described Enquist's passion for his work and his ability to convey that to students. "Professor Enquist's lecture style is engaging -- he tells you about things he loves, as if you were all having coffee instead of taking your mandatory lecture," wrote one student. Enquist's enthusiasm for teaching extends beyond the classroom into his laboratory and his office, where he spends many hours mentoring students. "In the time I have spent in the Enquist lab, it has been clear to me that the main objective Professor Enquist has for his lab members is not simply to produce results," wrote another student. "Rather, his goals for students are to understand the principles, discipline and excitement of discovery that comprise modern science, and to train future scientists to tackle the emerging questions in scientific research." Fuss joined the faculty in 1988 and also has served as director of graduate studies in the Department of English since 1999. She teaches courses on American women writers, contemporary feminist theory, feminist literary criti-cism, contemporary literary theory, literature and gender, and 20th-century American fiction. A widely published author, she has an international reputation as a critic and theorist. In nominating Fuss for the award, a colleague wrote that she has a clear view of "what it takes to be a real professional in the contemporary academic world." However, he wrote, "this sense in no way distracts her attention from undergraduates, who respond to her with what goes well beyond the usual respect and gratitude with which most Princeton students (justifiably) regard most of their professors and turns into an unrestrained, eager admiration, combined with a noticeable rise in their own intellectual rigor." Many students wrote in their nomination letters of Fuss' skills in making the classroom environment conducive to learning through open discussion. "Professor Fuss' classroom manner encouraged tolerance, the free expression of opinion and deep academic thought," wrote one student. "I have never taken so much away from one class." Others mentioned Fuss' devotion to helping students by responding to their work. "Professor Fuss represents to me the professional at its best," wrote another student. "Her research is brilliant; her classes are innovative and inspiring; her critical feedback is the most useful and thorough I have ever encountered; and her commitment to the well-being of students is absolutely obvious." Isenberg, a Princeton faculty member since 1997, teaches courses on the history of the American West and on American environmental history. He brings his classes to life for students through a mixture of dynamic lectures and a careful selection of supplementary materials ranging from primary sources to film clips. "He is a meticulous planner who has full mastery of his subject," wrote a colleague. "Organization, thoughtfulness, good humor, inventiveness, enthusiasm and a consistent willingness to give of his time and energy -- these are the qualities that Drew brings to bear, persuading students that learning is about effort and well worth it when done right." Several students wrote of his ability to engage the entire class in a dialogue. "He always posed questions that seemed maddeningly simple, yet proved intractable because they were the crux of the issue," wrote one former student. "Lively, intellectual debates typified Professor Isenberg's seminars, which rank among the fondest memories I have of my entire education." Other students praised Isenberg's skills in presenting alternative interpretations of the history of the American West and encouraging students to look at the issues from different viewpoints. "Balancing theory, history and anecdote," wrote one student, "Drew conveys the contested theory of the West in a challenging way, forcing his students to reconsider their cultural conceptions of the West." Stein joined the Princeton faculty in 1963 and has spent much of his career studying and improving upon Fourier analysis, which allows scientists to understand the harmonic content of wave forms. The winner of the 1993 Schock Prize in Mathematics and the 1999 Wolf Prize in Mathematics, he teaches courses on topics such as partial differential equations and complex analysis. To help his students better understand these subjects, Stein has redesigned a four-semester sequence of courses. "The great disease of undergraduate mathematics instruction has always been that the students spend years learning about basic tools without seeing what those tools do," wrote a colleague in nominating him for the teaching award. "The (new) sequence shows students basic Fourier analysis and real and complex variables while giving striking and important applications. I believe strongly that Eli's work on the sequence will change the way undergraduate mathematics is taught throughout the world." Several students mentioned not only Stein's mastery of the subject matter, but his outstanding ability to communicate with students. "The unifying theme in Dr. Stein's teaching is that he cares deeply about his students," wrote one in his nomination letter. "He consequently puts a lot of effort into teaching and a great deal of thought into how and what he teaches." Other students lauded his ability to create an inspirational learning environment in his classroom. "The most surprising thing about the class was the atmosphere," wrote one student who took a freshman class from Stein. "In what could have been a competitive class (smart, math-oriented freshman showing their stuff), there was instead a pervading feeling of serious intellectual desire, collaboration and unprecedented benevolence. Professor Stein exhibits a contagious love of math, and the prevailing feeling in his lectures is that it is his fondest hope that we will see how beautiful the math is."